One thing that film makers and media seem eager to do of late is to push the idea of a winning fat supporting actress. This idea is a welcome one, as there is as much beauty in a large woman presented well as there is with any other type of women. Bridesmaids made a huge push with Melissa McCarthy. Indeed, she had many of the better scenes in that movie. She also had a few of the worst. One hoped that with the positive press that Rebel Wilson received for her performance in Pitch Perfect, that this just may have changed. Once more, with her introduction as “Fat Amy” as well as several nuanced lines that indicated a deeper layer of perversion, she has some wonderful scenes. Then they work her name into just about every scene quite obnoxiously. Then there are scenes with food splattered all over her. By the time we see a big pile of vomit on the floor, it’s easy to figure that she will find her way into and all over it. She doesn’t: and that is a pleasant surprise. It’s obvious that the film makers have affection for her character, but they don’t know where the line between self-love and self loathing lay. One might wish that the actress could speak up and say, “Hey, I am pretty sure I only need to refer to myself as Fat Amy or Fat Patricia once. Perhaps twice.” But then, maybe like any young actor, they may be too happy to work on a grand scale to speak up. 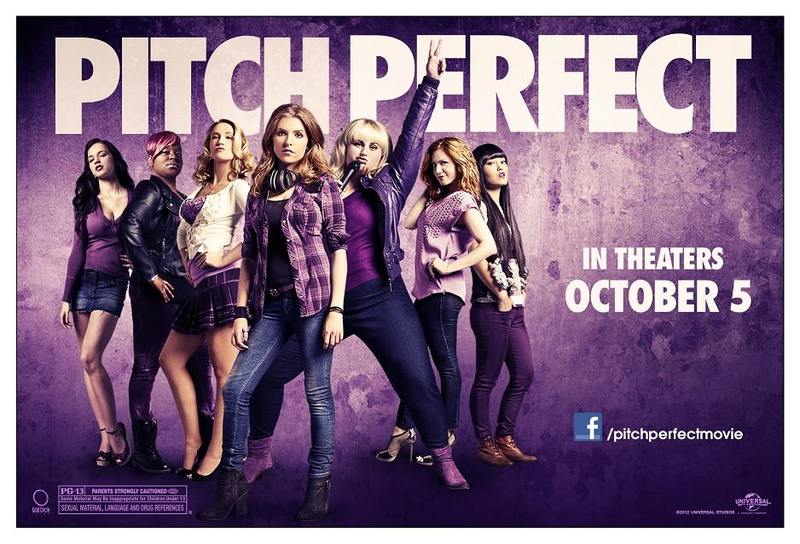 The shame of it is, aside from that, Pitch Perfect is a highly effective musical comedy. Getting Anna Kendrick (as Beca) after having been Oscar nominated for a college musical comedy is a stroke of luck. Having Elizabeth Banks as one of the producers probably helped. She is able to show compatibility with whomever she shares the screen. She can be bemused, detached, interested and unsure of herself all at once. I haven’t seen such a ready collection of facial expressions since Harold Ramis in Stripes. There is plenty for her to work with. The cast is filled with people who are both fun and funny. As her romantic counterpart Jesse, Skylar Astin gives an energetic and empathetic portrayal. Having a “habit of making himself at home,” he fits into the role of friendly competitor like Linus does with Charlie Brown in football. The rest of her A Capella team (The Bellas) provides a great collection of personalities all over the place. The afore-mentioned Amy/Patricia has many wonderful lines, especially when they did not involve flying burritos. The second banana in the Bellas, Chloe (Snow) is anything but typical. Rather than being a sycophant, she is supportive of the leader, but can think for herself. Snow provides some genuine moments this way, and the character allows the frigid leader Aubrey (Camp), somewhere to go when her methods hit the wall. As a result of the way the characters are drawn and played, both performances have more nuance instead of cliche. One could literally go on for pages when discussing the virtues of the bit players in this film. So many of the comic and personal moments ring fantastic and true. So much so, by the point that they get to the last song, and Beca says “I love you, awesome nerds,” you are right there with her. The commentary between Banks and Higgins is about as funny as anything I have heard since Fred Willard on Best In Show. The direction and script have much to do with this, of course. The songs are not forced into the plot, and as a result, they fit really well when they are supposed to fit with the characters as they are written. The last song for both the Bellas and the Treblemakers, definitely making the ending the best part. One can only hope that they don’t make a bunch of straight to video sequels for it, like they did for Bring It On. Anna Kendrick deserves to be a huge star. So does Skylar Astin. Brittany Snow, Anna Camp, Rebel Wilson too. Of course this reviewer also thinks Harold Ramis deserved to be a big star. P.S. – Don’t forget to watch the cast and fans take on the Nicki Minaj song Starships in the extras. It’s an exhilarating take that even my ultra-conservative relatives liked.